A/B testing is an essential component of large scale online services today. So essential, that every worth mentioning online business is already doing it. A/B testing is also used in email marketing by all major online retailers. The Obama for America data science team received a lot of press coverage for leverage data science, especially A/B testing during the presidential campaign. If you have been involved in anything related to A/B testing (online experimentation) on UI, relevance or email marketing, chances are that you have heard of Type I and Type II errors. The usage of these terms is very common but a good understanding of them are not. I have seen illustrations as simple as this. I intend to share two great examples I recently read that will help you remember this very important concept in hypothesis testing. TYPE I ERROR: An alarm without a fire. TYPE II ERROR: A fire without an alarm. Reducing the chances of Type II error would mean making the alarm hypersensitive, which in turn would increase the chances of Type I error. 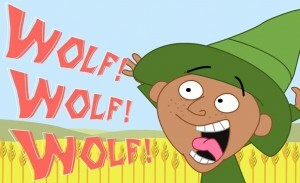 Another way to remember this is by recalling the story of the Boy Who Cried Wolf. Null Hypothesis: There is no wolf. Alternate Hypothesis: There is a wolf. The purpose of the post is not to explain type I and type II errors. If this is the first time you are hearing about these terms, here is the Wikipedia entry: Type I and Type II Error.